Nutrient requirements of fish is a complex process. When choosing comprehensive feed formula, we should starts from the existing raw materials, develop new protein source, fat, carbohydrate, which is suitable for freshwater fishes. On the basis of meeting the nutritional requirements, a comprehensive and relatively low cost of feed should be prepared, which can promote the development of freshwater aquaculture, to develop a good feed, it is necessary to have a comprehensive understanding of the nutritional composition of the feed. 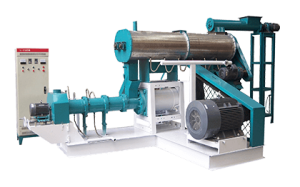 In the design of freshwater fish feed formulation, the main considerations are protein, vitamins and minerals. Protein is generally the first consideration in the formulation of nutritional element, fish needs twice or three times amount of protein than livestock, because of the poor ability of using carbohydrate, fish needs to consume part of the protein as a source of energy. Feed price is mainly determined by the level of protein, so the design of feed formula often firstly consider the level of crude protein, but attentions need to pay is considering the balance of digestible protein (DP) and amino acids more important, in addition to considering the level of crude protein. Fish has short intestinal , the type and quantity of bacteria is rare, so the synthesis ability of some vitamins is poor, a lot of vitamin need provided by the feed. Such as vitamin C is don’t need to add in livestock and poultry feed material, but in fish feed do need, it can improve the fish free immunity and anti stress ability. Fish absorb most of the mineral elements from the water through gills and skin, especially calcium, fish will not appear calcium deficiency, even if the feed does not supply calcium. Fish has different absorption rate for various minerals, when adding minerals in the feed, we should choose the inorganic salt, organic salt or chelate salt, which with high absorption rate. It is necessary to add right amount of trace elements in the fish feed, because Fe deficiency can lead to anemia, Zn, Mn, Co will cause short trunk. Omnivorous fish compound additive is according to the omnivorous fish biology design features, generally divided into two kinds: mineral additives and vitamin additives. The basic raw material: wheat bran (30%), soybean cake(35%), fish meal (15%), corn(5%), sophorae leaves(5%), barley(8.5%), auxin(1%), salt (0.5%), feed coefficient is about 2.03. The basic raw material: fish meal(10%), shrimp bran (20%), wheat bran (50%), corn(10%), dried sweet potato powder(10%), this is for adult fish. The basic raw material: bean pulp(24%), peanut dregs(24%), fish meal(5.1%), rice bran(43%), bone meal(2%), crude protein(28%), feed coefficient is about 2.2. Grass carp is a typical herbivorous fish, adults mainly eat weeds, fish fry in the early stage of cultivation mainly feed tiny protozoan, but they like to eat artificial fine feed in each growth stage. The basic raw material: Dry grass powder 45% (peanut vine, sweet potato vine ), soybean cake(15%), rice bran(15%), wheat bran(10%), fish meal (3.5%), corn(10%), bone powder(1%),salt(0.5%). Gurnet have wide feeding habits, mainly feed on submerged plant like Vallisneria natans, hydrilla verticillata, potamogeton distinctus, terrestrial grasses and leaves. The basic raw material could be: Silkworm pupa powder(5%), rapeseed meal(20%), soybean(13%), cottonseed(5%), corn(10%), rice bran(10%), wheat bran (20), grass powder(15%), crude protein(25%), feed coefficient is about 2.6. Feed is one of the biggest cost of fish farming, pay attention to scientific feeding method, it is not only conducive to the healthy growth of the fish, but also can save the feed, and effectively improve the benefit of fish culture. A. Fish feed pellet: The diameter of pellet feed is usually 2.5 mm -8 mm, length is 5 mm ~10 mm. 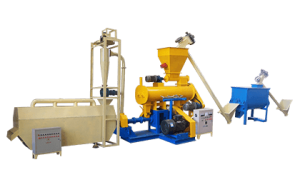 The fish feed pellet sizes differ when manufacture change the die of fish feed extruder. Pellet can be directly cast in the fishing pond, if the feed becomes wet, it should be dried and then use, if the feed goes bad, stop using anymore to prevent fish being poisoned. B. Oil-cake feed stuff: for fingerlings, oil-cake should be cracked, soaked, and ground into thick liquid, for adult fish, soaking and being soft is OK.
C. Grain feed: large particles of grain like corn should be crushed by fish feed crusher first, small particles of grain like paddy should use its buds, the tender bud has a high nutritional value, for fish it is easy to digest, absorb, and grow. D. Plant feed: plant, after removing the soil, are generally used to feed medium and adult fish. For fingerlings, plant feed should be crushed and ground into thick liquid, mixed with 0.2% of salt then splash into the water. Fingerlings more like the cooked plant feed, which with some bran and soda. E. Bran feed: for fingerlings, bran should be soaked and ground into thick liquid; for adult fish, should be used when it fermented to a wine aroma. At the beginning feed fish with small amount of bran, then gradually increase the amount, but can’t feed more than 30% of the total daily food. F. Protein feed: earthworms, maggots, and insects are high-quality animal protein feed for fish, can feed fish without processing. 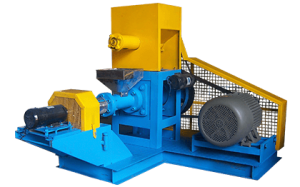 It is better for fish to dry and process this little animal into powder, then mixed with other fish feed. The massive animal feed should be chopped finely ground, then use adhesive to make small globular pellet. G. Feces feed: Chicken manure, pig manure and cow dung are quality fish feed. Dried this manure and ground into powder, then mixed with other feed in accordance with a certain proportion. The common proportion is 40%-50% for chicken manure, 50%-70% for cow dung, 30%-50% for pig manure. Thank you very much fanway for this kind information .